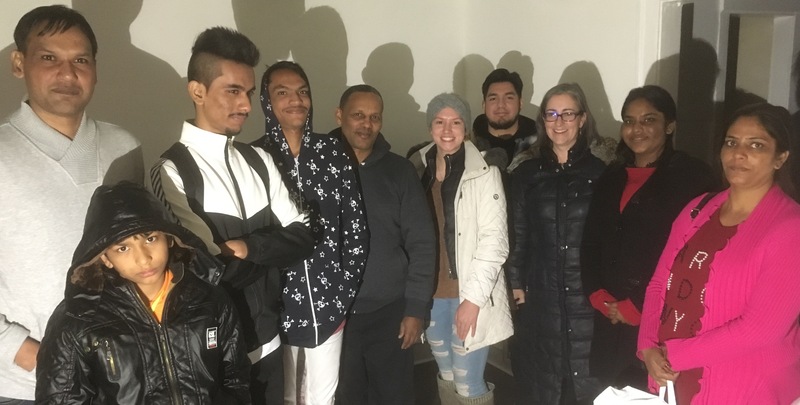 In this first of three posts, Jennifer Merck introduces a refugee family that All Souls helped welcome to America in November, 2018. Be sure to read the second part of this great story in Jennifer’s next post. Exodus World Service’s mission is to mobilize the Christian community to welcome refugees. If you’ve been around All Souls for a few months, you’ve seen the easel and write-on board pop up in the Narthex. Perhaps you’ve signed up to contribute a household item to a Welcome to America! Pack. Perhaps you’ve been part of delivering a Welcome Pack to new refugee family. We hope that, during your time at All Souls, you will have the opportunity to welcome a refugee family! During November, All Souls had the privilege of welcoming the Khalid family. Here’s what we knew about the family before we delivered the Welcome Pack. The father is an electrician, arriving with his wife and 4 children: three sons (ages 19, 15, and 9) and a daughter (age 17). For the past three years, they were in a refugee camp in Thailand, but are Pakistani. The family is Catholic. Having worked with refugees for many years, there are two hypotheses I might develop about the family, based upon the information given to us by Exodus. We don’t know if these are true of this family, but these thoughts can give you a glimpse into the types of journeys families go through to arrive to safety. The Khalids may have left their homeland due to religious persecution. This is a common reason for United Nations refugee status. Pakistan’s official name is the Islamic Republic of Pakistan. Sunni Islam is the official religion and Pakistan is 96.4% Muslim and 1.5% Hindu. Christianity is, by far, a minority religion. The Khalids may have been gone from their homeland, either traveling or in refugee camps, for a decade or more. It is not uncommon for refugee families with multiple children to have large gaps between two of the children, which can tell a tale of a journey to safety. Similar to rings on a tree stump telling of lean and plenty years, children often arrive before and after seasons of danger. The Khalids’ journey has surely been full of danger, sadness, and uncertainty. All Souls was privileged to welcome them to their new home just after Thanksgiving. I’d like to tell you a little bit about that welcoming, which was unusual for a few reasons. Check out the next blog post for more about our visit.